Karina's Kreations: Stampin'Up Envelope Punch Board Gift Card Holder! Stampin'Up Envelope Punch Board Gift Card Holder! Have you bought the envelope punch board yet? If not, I hope Santa will bring you one. 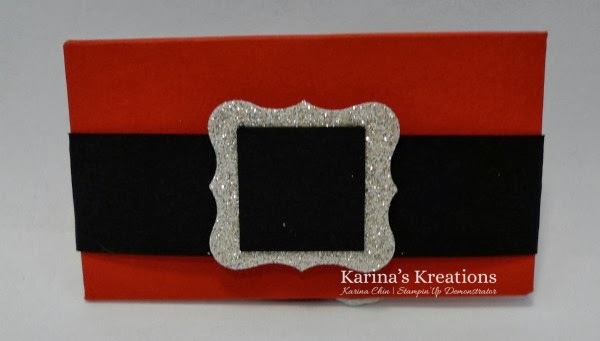 I had to share this super easy but fun gift card holder with you. I found it on the internet and Julie Davison has a video for it. 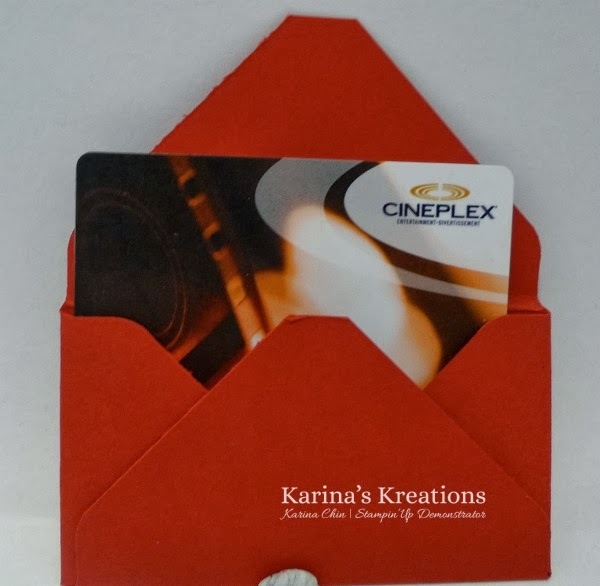 The dimensions for the gift card holder are on the envelope punch board. Start with a piece of 5" x 5" Real Red card stock and follow the instructions on the punch board. Wrap a piece of Basic Black 1" x 8-1/2" around the gift card holder and secure with sticky strip. Punch Silver Glimmer Paper with the Curly Label punch and attach to the Basic Black card stock. Punch a black square with the 1" square punch and attach to the silver glimmer paper. If you scrape away the silver glimmer paper with a pair of scissors, the black card stock will stick better. I hope you'll try making one of these. There are still great products on the clearance rack. Shop Now!